What makes Indestructible different? Its unique Bounce Back Technology that allows hair to return to its styled shape even after the daily stresses on hair. Whether these stresses are wind, clothing, humidity, or simply running your hands through your hair, Indestructible ensures a 24h hold. Specifically for extreme looks, Indestructible’s concentrated formula allows for shape memory so that your hair returns to its initial style without leaving any greasy residue. Creates a more natural look and enhances a range of styles to provide ultimate all-day hold. Best hair product and my husband's favourite. In fact, he generally refuses to use anything else and has really nice thick dark hair but prefers the strong hold of this wax with the matte finish to other shinier waxes that wash out or wear off easily throughout the day. Can't wash it out, how in the world can it be acceptable not being able to get the wax out after 4 times washing? I am surprised there are no more complaints about this. Best hair wax ever for really fine hair! Stays in and styles well, yes it does not wash out easily but that's a bonus for fine hair, after shampooing my hair feels clean, but it still has a bit of wax in it which is great! I would have to agree with Kuan. This stuff is impossible to get out. Even after 2 wash I can still feel the wax there. I try to use a towel to wipe it off but all it did was make my towel full of wax and I had to throw it away. 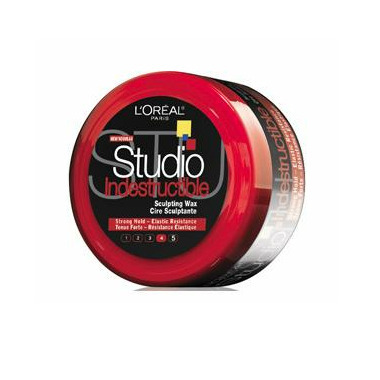 All hair wax and gel do the same thing, that is to hold your hair except this one is really 'Indestructible'. I had to washed my hair 4 times in order to clean it. Can bare the mind to do this everyday. Worst hair product I've ever use.